Filling the feeder is just the first step. A clean feeder is a life-and-death matter to some birds. To protect the birds at your feeder, clean it at least once a week, more often if necessary. Rake the ground underneath, too. 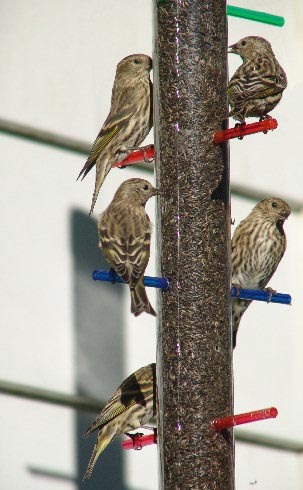 Pine Siskins are especially prone to salmonellosis, a bacterial disease. You can learn more about feeding backyard birds at Cornell's AllAboutBirds. California Partners in Flight has more suggestions about feeding birds safely! A clean feeder is a life-and-death matter to some birds. Pine Siskins, in particular, are prone to salmonellosis [sal-mun-uh-LO-sis], a deadly bacterial disease easily transmitted from bird to bird. For this reason, a thistle feeder shouldn’t have a tray. Birds are fussy. This bird wants sunflower seeds, and another wants millet. [More chatter of Pine Siskins] They’ll simply toss any seed they don’t like – what a waste! You can attract specific birds — and minimize the waste — by choosing the right food and the right feeder. Call of the Pine Siskin provided by The Macaulay Library of Natural Sounds at the Cornell Lab of Ornithology, Ithaca, New York. Recorded by G.A. Keller. Black-capped Chickadee by S.R. Pantle.